There's still time to refuse the test. You will need to take action soon. The tests begin Tuesday. Send a letter. And, as you do so, be brave. You may receive no response--or you may receive a letter delivered express, hoping to change your mind. I wrote my opt-out letter over Christmas. I received no formal response, but one of my child's teachers informed me during conferences she was aware of the situation. As she had once taught an older sibling who opted out, I knew she would not force children to sit and stare. Instead, students engage in academic pursuits of far greater value than test taking. My friend opted our more recently. She received a formal letter from an assistant superintendent of her district. It was quite involved. She was informed her child would be "provided with grade-appropriate literature in lieu of the assessments." 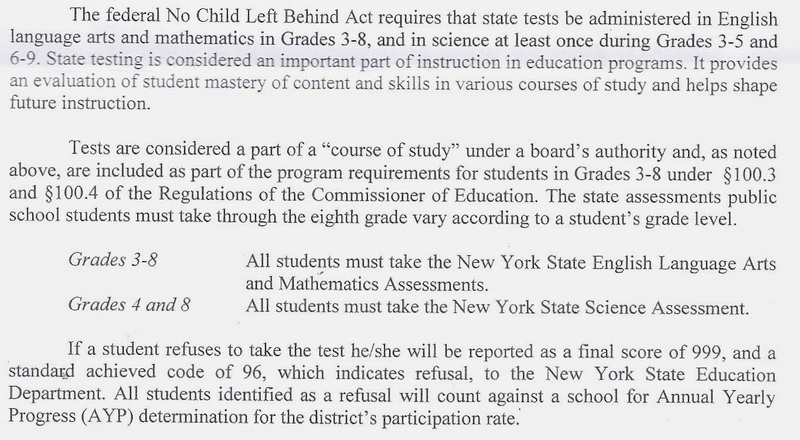 The letter, however, was worded to make the reader think twice about opting out a child: "While we understand your concern..., please be reminded that there is no provision in New York State statute or regulation allowing parents to either actually or effectively opt their children out of state assessments." The letter might also state that neither is there "actually or effectively" any prohibition of parents opting out kids. Someone is running scared. At fairtest.org, one can read about the possible ramifications of refusal. There are next to none. The only possible problem for a school district might result, it seems, if the school is in the bottom 5% due to a 95% rule, formulated to prevent schools from discouraging their weakest students from taking tests. If these schools fail to meet AYP (Adequate Yearly Progress) for two consecutive years, they may need to set aside 15% of their Title I funds to either transport kids to a non-failing school or to provide tutoring services. Schools that do not receive Title I funds, however, are exempt from NCLB and, thus, seem unlikely to suffer at all. My friend's school would fall into the latter category. Yet, the letter grew quite legalistic, doubtless, in the hopes to confusing parents and, perhaps, changing their minds or discouraging more refusals. The school defends the tests as "an evaluation of student mastery of content and skills in various courses of study and helps shape future instruction." This school district seem to miss much of the controversy over the validity of these exams, the duration of these exams, the stress engendered by these exams and the political ends to which these exams are used and their cut scores set. This school district seem immune to considerations of the perversion of education that has become test prep. This school district seems unnecessarily worried about refusals counting against its "district's participation rate." The letter concludes by noting that the District is legally obligated to determine whether or not students who opt out need Academic Intervention Services "through the use of other measures," including prior State Assessments, local assessments, reports from teachers and "progress monitoring." The letter reminds the parent that "if a student requires additional services through AIS to make progress, the District is obligated to provide them." If children are in need of academic intervention services, I would guess the schools have already made parents aware of the fact. If the test alone was a measure, close to two-thirds of our kids would need academic intervention services. Indeed, if the 100% proficiency rates demanded by NCLB were enforced, all of our schools would be failing. After thoroughly attempting to confuse the issues with convoluted language and references to mumbo jumbo, the letter concludes, "I hope the above has clarified any outstanding questions you have about [required participation]... in the state-mandated assessments and the District's continuing obligation to determine their eligibility for AIS in the event that [the student]...refuses state assessments." I guess this school district missed the part of the parent letter stating that the student is refusing the state assessment, or, perhaps, they hope their long-winded letter might change a few minds. It wouldn't be changing my mind and hopefully it wouldn't change yours. Remember, even the President's kids, sheltered at the Sidwell Friends School, aren't subject to any of this testing crap created by his administration for the rest of us.